Rome is the 'Eternal City', and is the capital of Italy and of the Lazio region.Rome is a millenium-long centre of power, culture and religion, having been the centre of one of the globe's greatest civilizations ever, has exerted a huge influence over the world in its c. 2,500 years of existence;. hiring a car is a great idea to explore all its exciting sites and surroundings. Rome’s historic centre is a Unesco World heritage site. It offers a variety of beautiful palaces, historic churches and basilicas, ancient ruins, astonishing statues and sculptures, romantic fountains and a cosmopolitan atmosphere, making it one of Europe and the world's most visited, famous, influential and beautiful capitals. Today, Rome is regarded as a shopping heaven for all those fashion enthusiasts, as it is one of the top fashion capitals of the world. The best and the cheapest way to explore all its fascinating shops, boutiques and museums is by hiring a car as it will save you all the money that you would spend on taxis and public transportation giving you freedom and peace of mind. 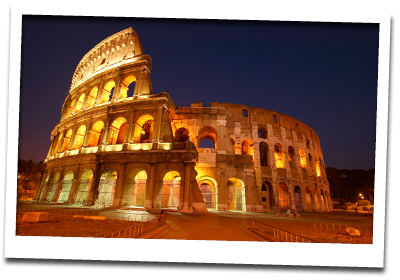 Of course, the top tourist and most famous attraction in Rome is its famous Colosseum,. It is one of the many amphitheatres spread all over Italy, however this one is the biggest ever built in the Roman Empire. After visiting the Colosseum you could head with your hire car towards the Basilica of St. Peter, to see the residence of popes, marvellous architecture, sculptures and paintings. If you get tired of driving with your hire car on the very busy Rome streets, head on foot towards the Roman Forum to feel the ancient atmosphere and ambience of the Roman Empire. If you are a fan of Michelangelo’s genius you should spend some time near Piazza del Campidoglio where you will find a marvellous egg-shaped paving design that was executed just after 1940 as earlier popes did not allow it due to its less-than-Christian subtext. An interlaced twelve-pointed star makes a subtle reference to the constellations, revolving around this space called Caput mundi, the "head of the world." If museums are your thing, visit the Capitoline Museums which are just next to Piazza del Campidoglio. You can indulge yourself in the impressive collection of ancient, medieval and renaissance art that also reflects the impressive history of the Roman Empire and the city of Rome. Afterwards, take your hire car and visit Castel Sant’Angelo, also known as Mausoleum of Hadrian, which towers over the Rome cityscape, with a sculpted angel on its top and from which the building derives its name. The site that is absolutely a must-see, is the ingenious Sistine Chapel painted by Michelangelo. If the ancient architecture of the Pantheon and Vatican Museum are not too interesting for you, jump into your hired car and move towards Museo D’arte Contemporanea Di Roma to see all the classics of contemporary art of the 20th century or visit MAXXI - Museo Nazionale Delle Arti del XXI Secolo, the latest presentation of Zaha's Hadid architecture genius, housing the most cutting edge art pieces of 21st century. After a whole day in the museums, you should relax and recharge your energy in the Villa Medici where you can take a short walk in its beautiful and peaceful gardens and get some amazing, panoramic views of Rome to shoot those amazing snapshots that you are after. If it happens to be a romantic trip with your loved one, Villa Borghese is the palace to be where love is in the air and cupids are hidden in every corner. Drop your car hire in a nearby parking spot and take your loved one on a romantic rowing boat trip. If you have still enough energy, pick up your hire car and drive towards Piazza Navona, to get one of those famous Italian espressos, and just sit there in one if the many cafes and watch the crowd fill the beautiful square in late afternoon. When you have relaxed, jump again into your car to catch up with latest fashion trends in some of the world’s top fashion boutiques, shops and jewellery specialists in Via Condotti. Make sure you hire a big enough car to fit all those shopping bags and souvenirs that you will buy! Rome, is the Eternal City that never sleeps and as such, offers great night life with a vibrant club scene and amazing bars. A good point from which to start your journey is the Spanish Steps Church, to catch up with the international crowd and learn how to say hello; not only in Italian! Rome has two major airports Rome Ciampino Airport (CIA) 14.4 km from Rome and Rome Fiumiciono Airport (FCO) 23.1 km from city center where you can get your Firefly car hire.